I just experienced a two-day server outage, or I would’ve posted sooner! Feels good to get some things off the needles, I must say. 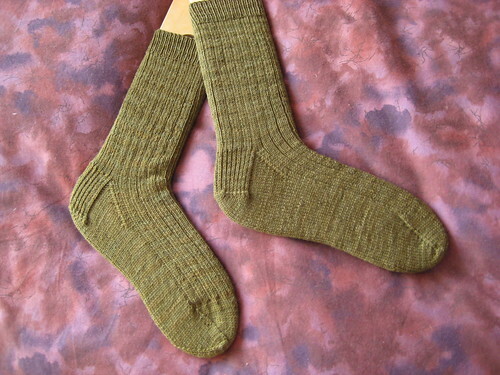 These are just basic socks, 68 sts on Knitpicks US 0 (magic loop) and the yarn is Lorna’s Laces in “Cedar”. I still have another skein (I had three for some reason) so I can’t quite decide if I want to return it or make a matching pair of socks for me. These are for the boyfriend. Or alternatively, I suppose I could just make a second pair in the same colour for him. These sock blockers really work nicely for displaying the socks! I got mine at the Knitter’s Frolic this spring from PickUpSticks, but hadn’t used them before the other day. I’ve been adding projects to Ravelry, slowly, but it’s taking a long time! I’m done my 2007 and 2006 projects (for the most part, I think, there might be a few missing in there somewhere) and now I’m onto the 2004-2005 photoset, which contains a whopping 99 photos! Don’t worry if you haven’t gotten your invite yet – it’s seriously better, this growing slowly. It would just implode if everyone joined at once! I’ve been on since May, when Jess emailed and asked if I would check out this site she was working on. It was a neat idea then, and now it’s grown into a tremendous effort. It’s very cool. Currently knitting Titbits and secret presents, which are almost done. I’m itching to start new projects, but still trying to be good and finish stuff! Plain socks are so underrated – must everything be multi-coloured hand-dyed lace and cable monstrosities? I’m having a hard time uploading everything to Ravelry myself – I can’t image uploading yours – you knit so fast you must have a ton of projects! Hmmm, you must be a DreamHost customer too….did you loose all your emails from the last 24 hours as well? I did….grrr…..
Socks are lovely, and the blockers are great! Great to have you back! I just finished with you archives and feel good about being a comment-poster now. Your socks look great! I vote for a matching set for you. ‘Cuse that’s just romantic, you know? i’m taking the lazy knitter’s route and only uploading current projects. perhaps i’ll get around to the archives some day, if i can stop spending so much time checking out everyone else’s notebooks! Aw! I love the socks, as usual. Mind if I link to them?